The beginning of September means one thing and one thing only: the beginning of Fall Fashion Week across the world. 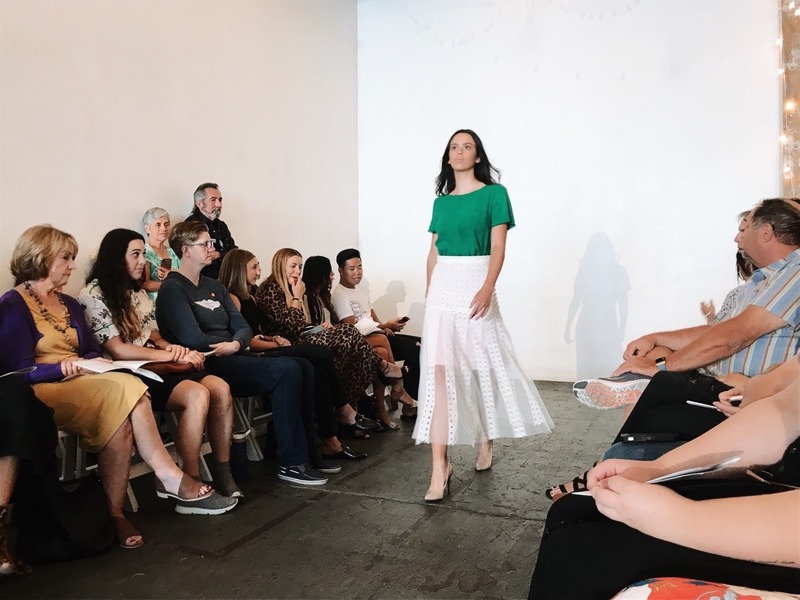 As New York Fashion Week was in full swing, Salt Lake City hosted a few shows of its own to pay homage to the fashion gods and offer local designers a space to showcase their latest designs. 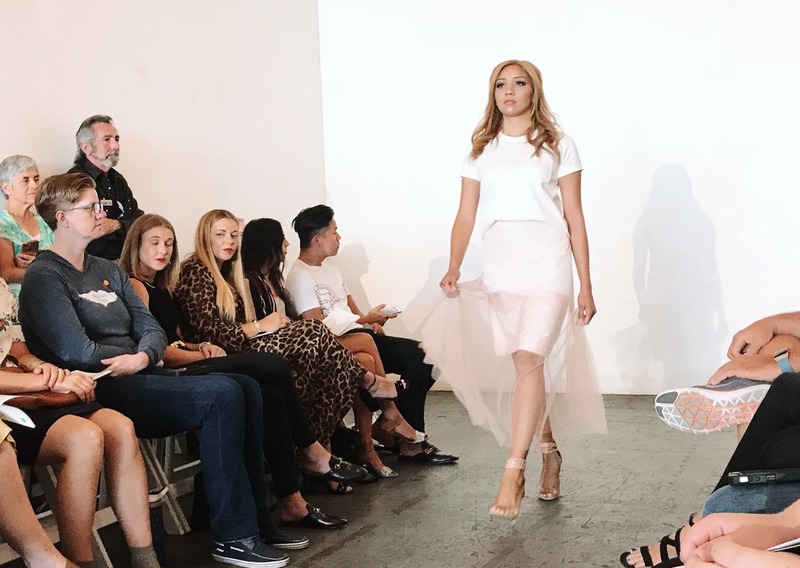 A last minute decision led me to grab front row tickets to the ‘Up and Coming’ show at Utah Fashion Week 2018, where I get to know some of the designers making waves on a local level. 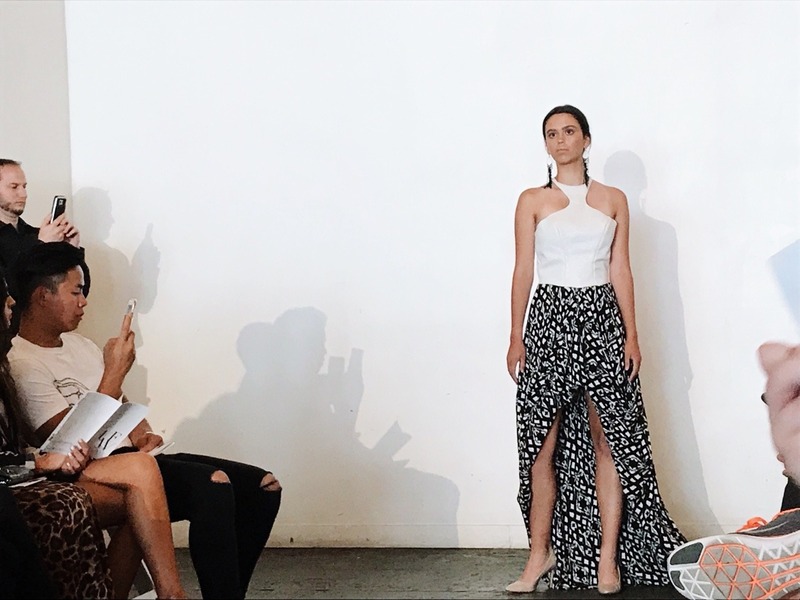 Here’s who you should be keeping an eye on in the local fashion world! As the music turned on to set the mood and one of the first models began to walk out in a sheer, gauzy black dress, I fell in love at first sight. I pictured myself wearing the dress at every given opportunity, and then thought, How can I get my hands on this after the show? Then a pantsuit and more dresses walked out, which made me quickly realize that I wasn’t just in love with one dress -- I was in love with the entire collection. 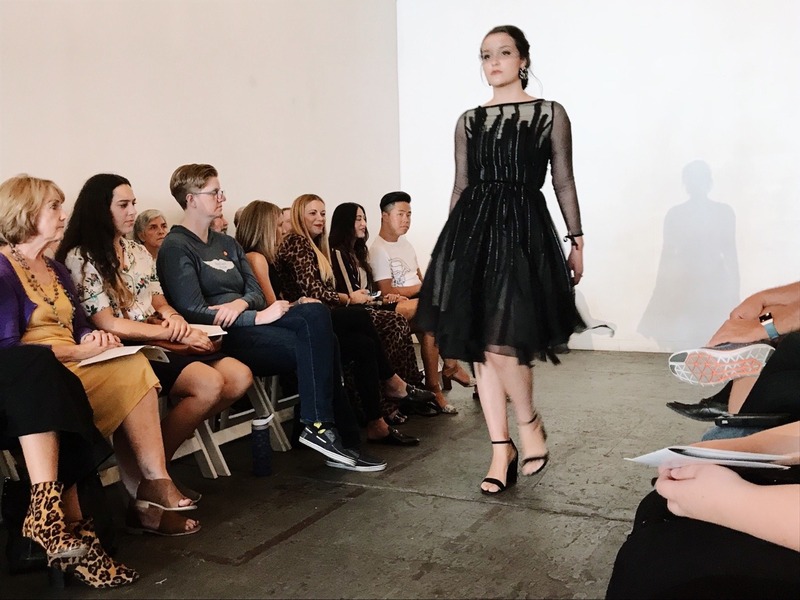 Shyleen’s style embodies everything I want in my personal wardrobe: dark, feminine, and detailed pieces that garner attention. There were two pieces that distinctly stood out, one being a glittering champagne full-length dress, which was refreshingly unexpected among the mostly dark-toned collection. The other, which was saved for last, was a black dress, full with movement and trailing lightly on the floor, with gold applique flowers cascading down the length of the dress from one of the shoulders. Needless to say, Shyleen’s collection left me drooling and set the bar deservedly high for the rest of the show. 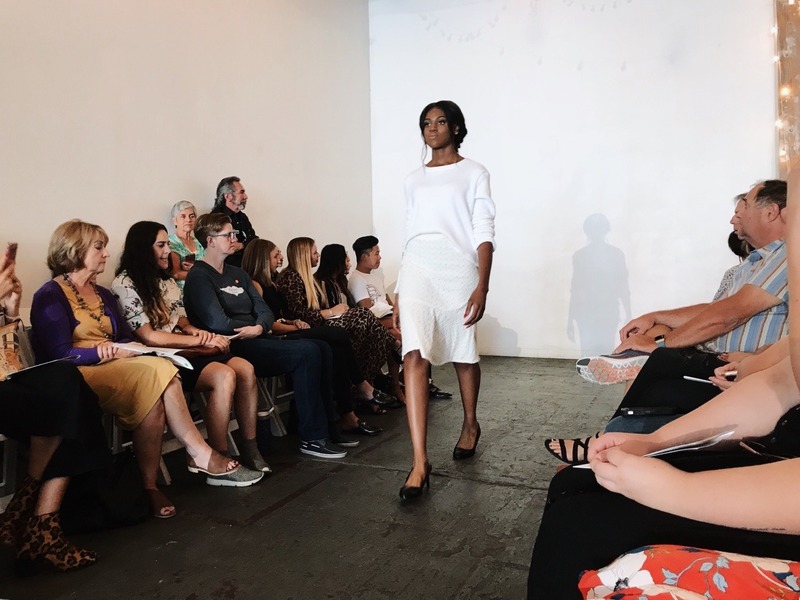 Ashley Cook’s subtle, light, and structured collection surprised me in all the right ways. Up top, the pieces were relaxed and simple, consisting of loose-fitting t-shirts, dresses, and one incredibly comfy looking sweater. 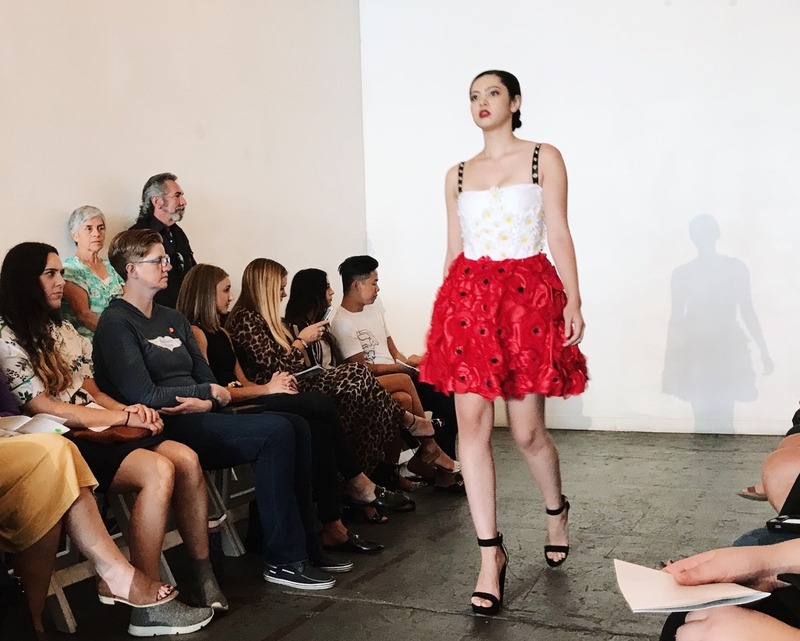 Complexity and detail were saved for down below, making her skirts and dress bottoms that featured a fitted waistline and flowing accents stand out against the simple tops. One piece that really caught my eye was a white, ankle length skirt that was fitted at the top but soon opened up to flowing ribbons of tulle. I loved that this collection incorporated movement and flow, whether that be through tulle or the same material of the skirt or dress, while maintaining a fitted waistline and overall structured appearance. Riley’s punchy and free-spirited collection, full of loud designs and bright colors, was just plain fun to watch walk down the runway. 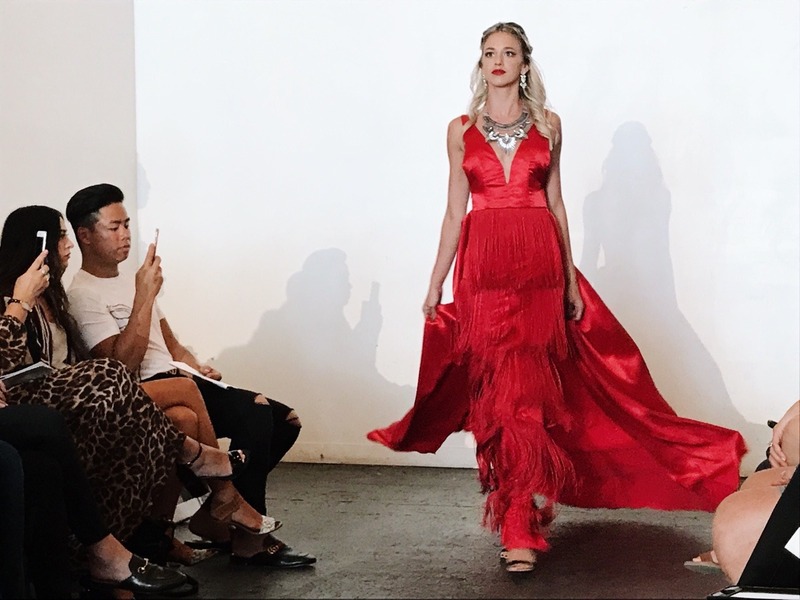 Pops of red made their way into most into the collection that hints at a western desert vibe, with fringe, leather, and flowering details. Each piece was completely unique from the rest, from gingham pants to flowering dresses and everything in between. There were three outfits that really captured my attention and held it like a vice grip. 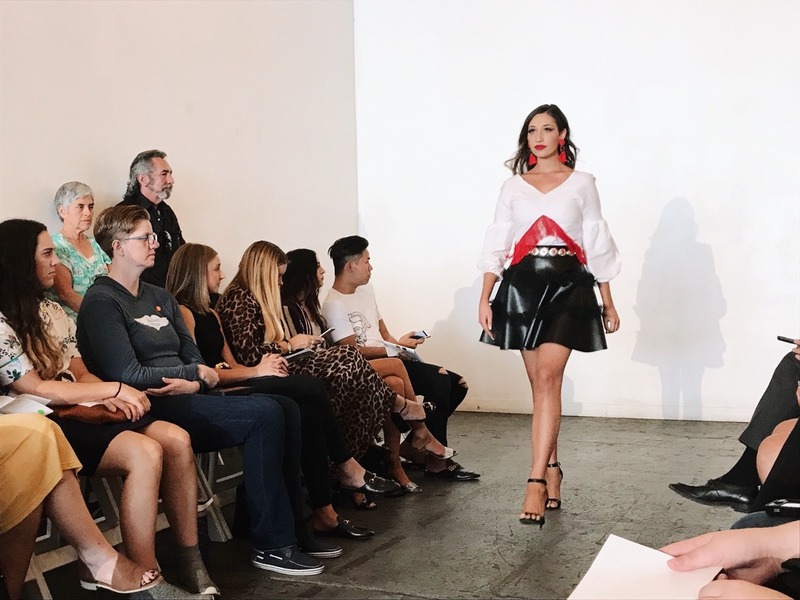 The first was a leather skirt paired with metal accents at the waistline paired with a billowing white shirt with a V-line of red fringe, a fresh take on something you might see in a western film. The next dress was a total vision -- a white bustier top adorned with applique daisies, and the bottom with red applique poppies. My jaw may have hit the floor when the last dress walked out -- I honestly don’t remember because I was so captivated. The absolute glamour of the scarlet red dress, with layers of fringe and a billowing train, left me completely speechless. 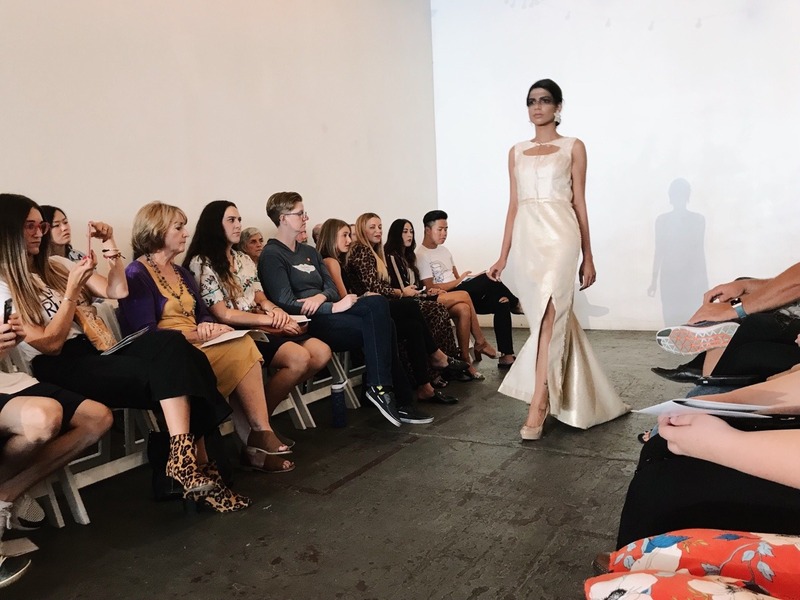 Matthew Alpin’s collection was all sophistication, class, and glam. His entire collection was something I would wear if I were someone’s rich aunt throwing a dinner party filled with people I wanted to make jealous. Every piece was full length and leaned more toward darker colors, except for two standout pieces. 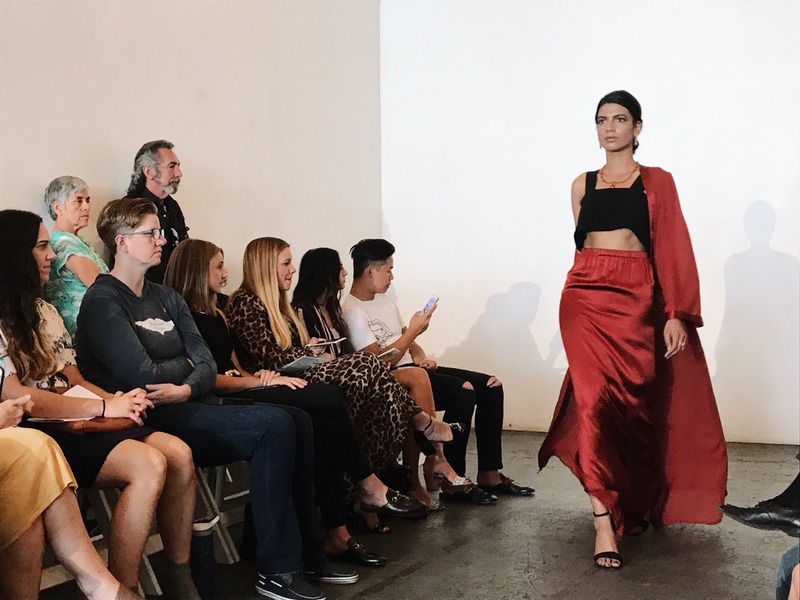 A three-piece set consisting of a fluid burnt sienna skirt and robe paired with a black cropped top made me audibly gasp when it first walked out. 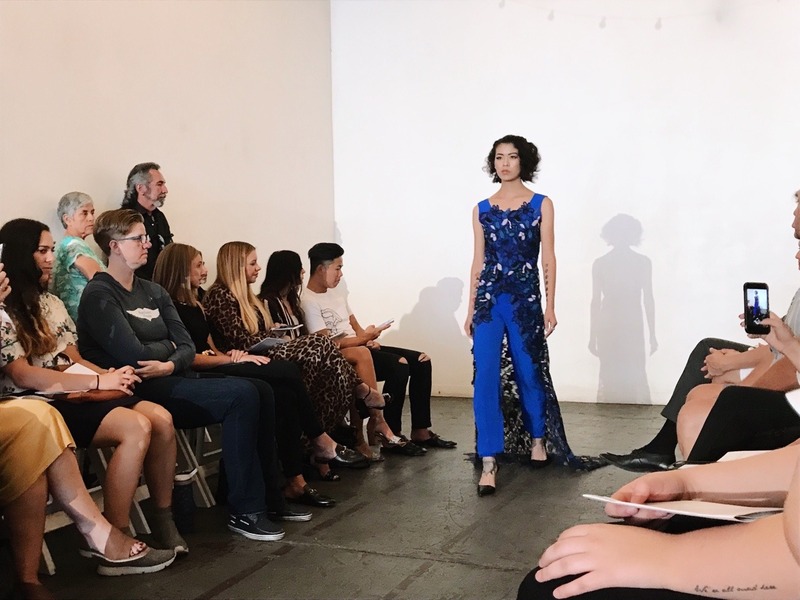 The design itself was relatively simple, but something about the combination of the color, texture, structure, and movement of the fabric transformed it into a total showstopper. As for the last outfit, bright blue pantsuit with a long lace train? Sign me up. The blue, green, and white botanical print lace that adorned the front and back of the pantsuit completely elevated the elegance and style as it draped into a long train. Both standout pieces were easily some of my favorites from the whole show. Doris Marquez’s collection screamed tough, self-assured, and fierce. 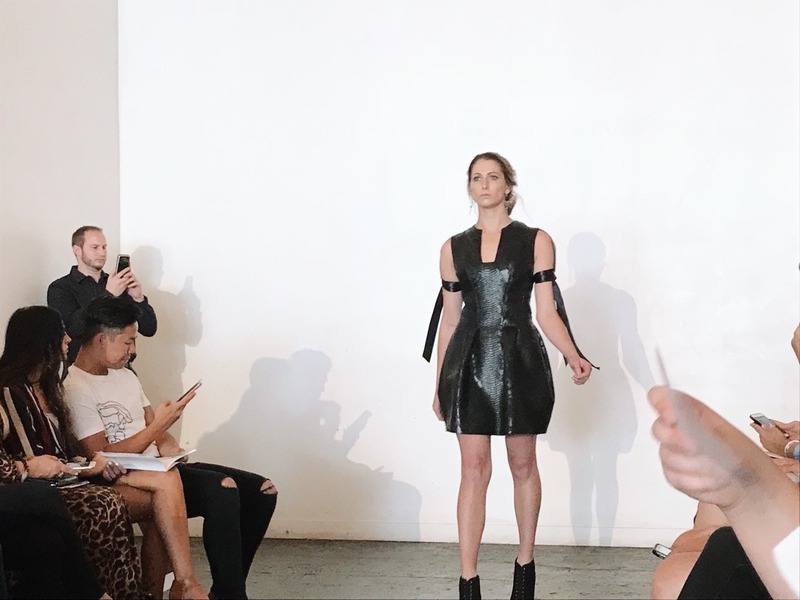 The collection consisted of a mix of leather, snakeskin prints, and armor-like designs while using both dark and light colors, along with a little metallic. One thing that I really admired about a pencil style dress was that it looped up around the back, making the back of the dress slightly shorter than the front, adding originality and flair. 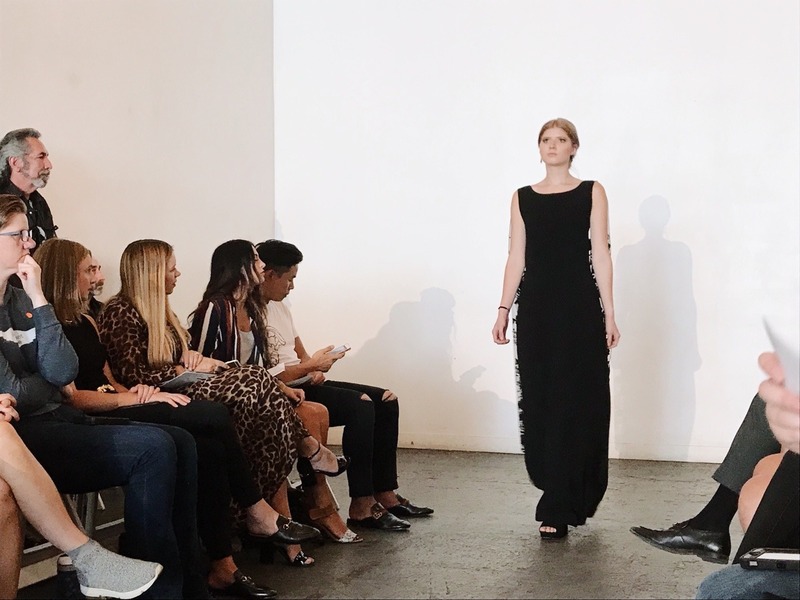 A black structured dress, consisting of black, leathery, reptile-like material, was something that made me feel like I could command an army, which ended up being a recurring feeling while watching her collection. The finale dress highlighted a white snakeskin-style halter top paired with a loud diamond pattern on the flowing fabric at the bottom of the dress. Every piece in Doris’s collection was sure to make you feel like a badass. The collection by Kastle Christensen, under the name KASNKELS, took me by surprise. I had a hard time trying to interpret what I supposed to be sold on and what the overall theme was, but I had a damn good time trying to figure it out. 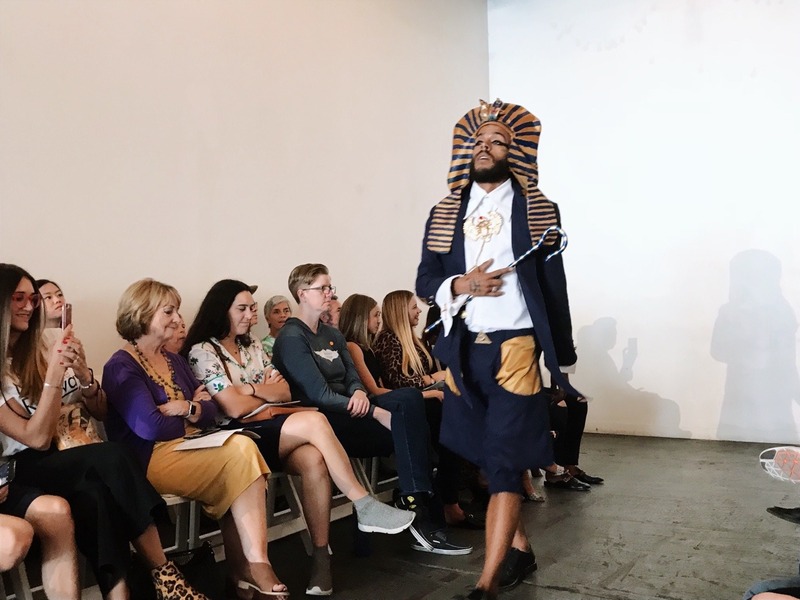 The entire collection was a mix of Egyptian symbolism, Peter Pan and the Lost Boys –esque overalls and shirts, with a couple of bolo ties thrown into the mix. 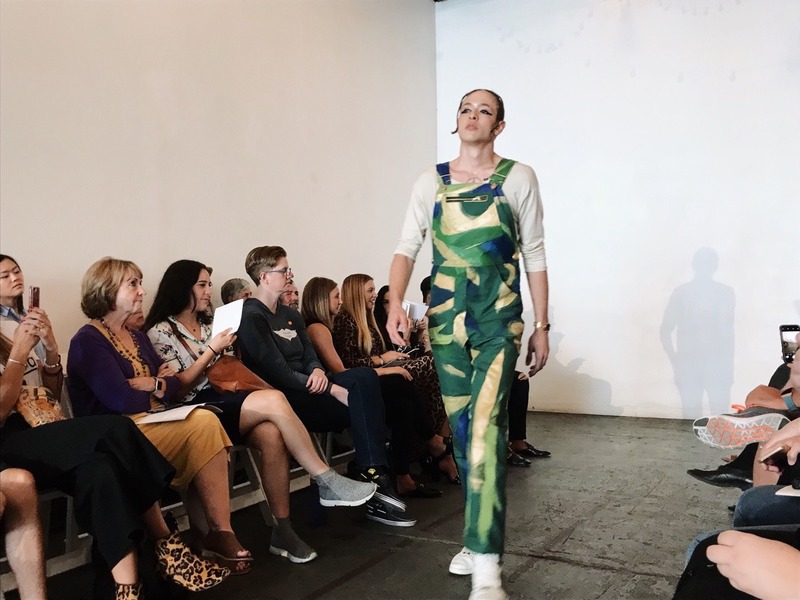 I honestly don’t even know what else to say about this collection other than its eccentricity was refreshing and entertaining, and I also really liked the overalls. 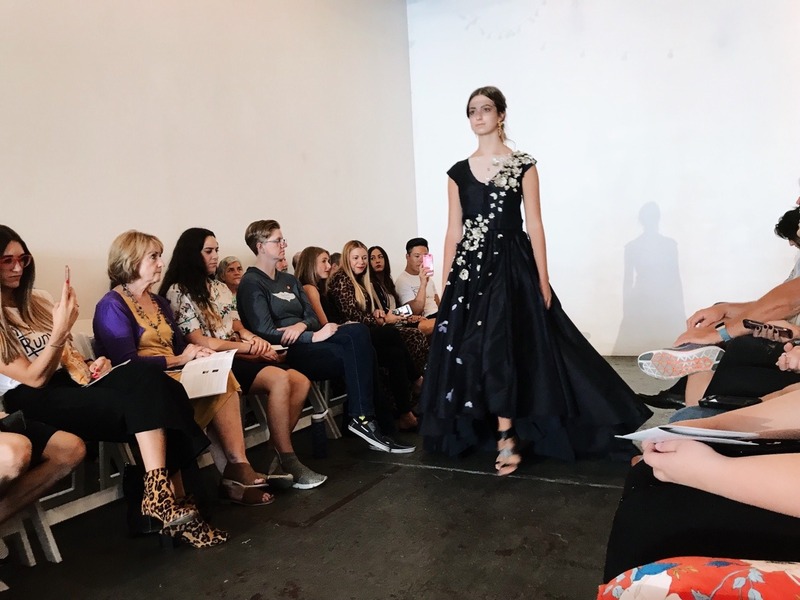 Utah Fashion Week, while obviously not the big leagues like New York or Paris, was so fun to be a part of. I love any excuse to support local artists, and local fashion was a realm that I had previously left untapped. For now, we’ll just have to wait and see what’s in store for us next year!